Glassine envelopes, acid free for negative storage. Open end, thumb-cut, side-seamed. Archival quality, white writing edge, crystal clear. Allows for the study of your print without removing it from the sleeve. Packed in 100 per pack. Completely transparent. 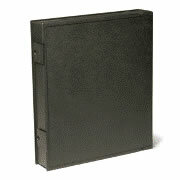 Fits all U.S. standard 3-ring binders: 8¼"x1¼". Convenient. Offers good protection for your valuable negatives and prints. current Print File Spinner rack. Protects from dust, scratches, and fingerprints. Archival quality NO PVC – safe for long-term storage. Your most treasured photographs, letters, tech-notes, formula sheets, clippings or other collectibles are safe in Lineco's collector album. Made completely from acid-free materials. It is your best choice for long lasting storage and protection. The optional Mylar Page Protection with Blue/Gray inserts are acid-free envelopes on the inside back cover which offers safe temporary storage prior to mounting. The album comes without the Mylar pages. Sizes 8½x11"; 10x10"; 11x14"; 16x60"; 20x24" also available. Please call for price and availability. Our specially formulated 3-mil archival polypropylene has a physical density that is less than other sleeving materials, making it more pliable and gentle to your film. Strong and durable, PRO-LINE won't become brittle or abrade film. PRO-LINE sleeving is optically clear, neutral in color, and has a unique anti-Newton ring surface that reduces distracting Newton ring as well as minimizing the actual surface area that is in contact with your film. All sleeving is available in clear both sides and clear front with frosted back for even light distribution. Protects inkjet & Thermal Prints from moisture, fingerprints, scratching, dirt etc. 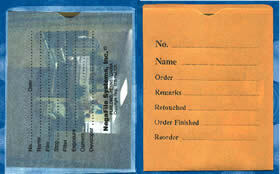 Allows Safe Viewing Through Crystal Clear Archival Sleeve. Eliminates Prints from scratching each other during shipments. Available in all Inkjet Format and Clear-Open Flap (COF) or Clear-Sealed Flap (CSF).